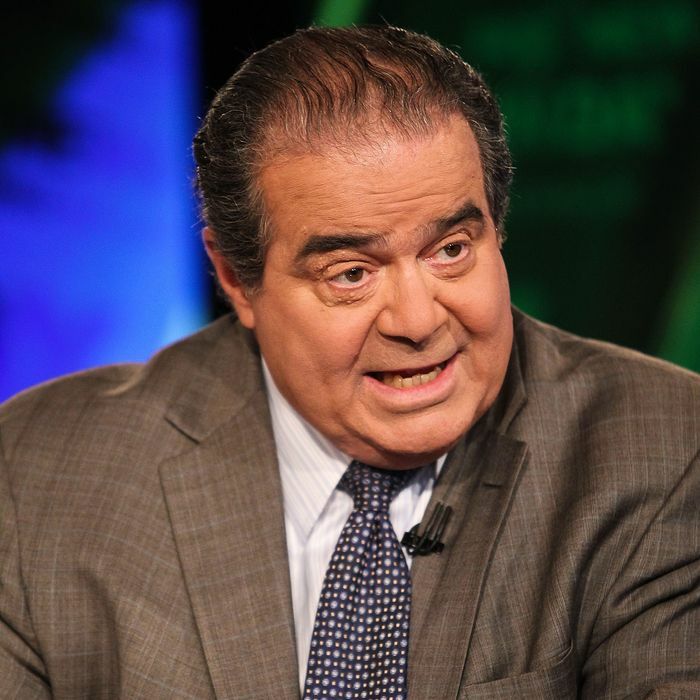 Supreme Court Justice Antonin Scalia is still smarting over the decision to overturn the Defense of Marriage Act, thus giving in to the “so-called homosexual agenda.” (As he wrote in 2003, “by which I mean the agenda promoted by some homosexual activists directed at eliminating the moral opprobrium that has traditionally attached to homosexual conduct.”) Speaking in Montana yesterday, Scalia said, “It’s not up to the courts to invent new minorities that get special protections,” but that it should be left to Congress or to the voters. The DOMA decision, he argued in his shade-filled dissent, is made up of his colleagues’ “scatter-shot rationales” and “legalistic argle-bargle.” But don’t even ask about term limits for justices: “Who is drooling on the bench?” Scalia said last night. Don’t answer that.